Spotify is opening up its premium service to users for free, announcing a seven-day trial for those who have yet to sign up. The premium version of the service means you can stream content via the Spotify mobile app, have offline playlists and enjoy the 10 million or so tracks without fear of adverts spoiling proceedings. There is a caveat to the seven-day trial: you will automatically be signed up and charged for one-month's access to the service, unless you cancel this through your account before the seven-day trial period is up. The free trial is yet another push by Spotify to get users to start using the premium version of the music-streaming site. Spotify Premium currently costs £9.99 a month, with Spotify Unlimited costing half this but not offering the mobile functionality. Spotify has started to limit its free version to just 20 hours' listening a month plus adverts. 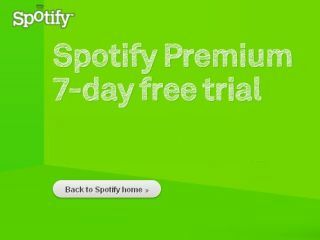 To sign up to the seven-day trial, go to www.spotify.com/uk/freetrial.